Description of "Flame in Chalice"
Nicholas Roerich is master of the singing word no less than of the singing form and color. His poetry is direct, simple, arrow-like. It has the same vibrant touch of the master, the same sense of mysticism and cosmic unfoldment found in his paintings. The depth and intensity, the rhythmic sweep and exaltation that mark his work as artist is no less present here. His lyric words, like so many singing arrows, fly straight to their invisible goal. Light rays out powerfully from the lines. It is evident that they have been "made in flame as nature makes." In the poetry of Roerich, finally, there is a fullness and expansion of consciousness, a vibration of light and color, a sense of prophecy and ongoing, of search, discovery and fulfilment that is as much part of his singing word as of the colors and contours of his brush. These poems are true children of the Flame in Chalice. Nicholas Roerich (1874-1947) is known first and foremost as a painter. His paintings, of which there are thousands around the world, explore the mythic origins, the natural beauty, and the spiritual strivings of humanity and of the world. But Nicholas Roerich was as prolific a writer as he was a painter. He wrote books, poetry, and almost-daily essays on life and events (called Diary Leaves). 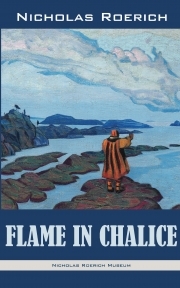 Reviews of "Flame in Chalice"